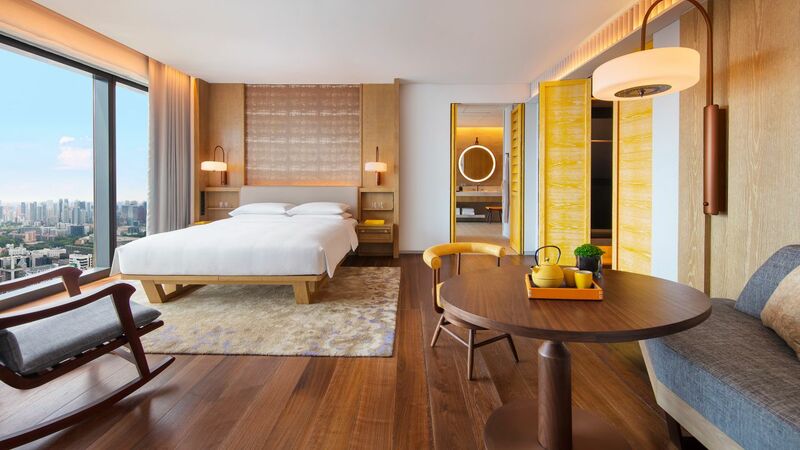 Designed by esteemed interior architect Andre Fu, all 342 of Andaz Singapore hotel guestrooms are inspired by the locale, and features organic, fluid spaces with warm russet and mustard tones. Got a question? Talk to Andy our chatbot now! Unwind in this 76 sq m (818 sq ft) guestroom with a king-size bed, a day bed and floor-to-ceiling windows framing stunning views of Singapore’s skyline and Marina Bay area. With an entrance leading into the bedroom, the Andaz Studio Suite King features an additional living room, a bathtub, a powder room, a rain shower, and double sink vanities in the bathroom. 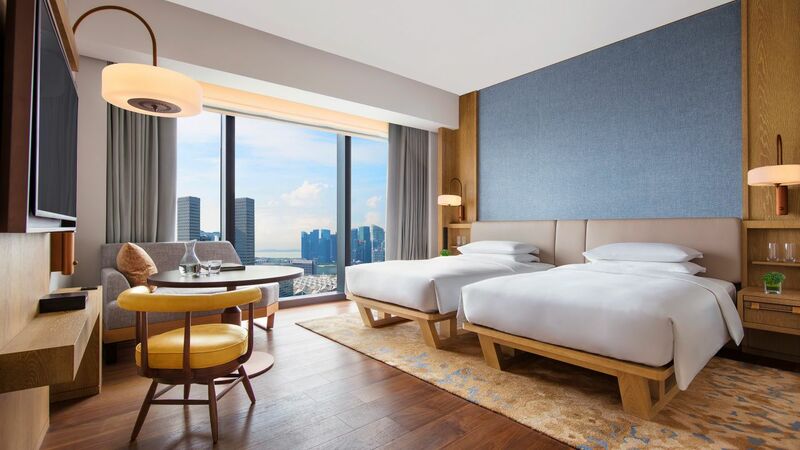 Unwind in this 76 sq m (818 sq ft) guestroom with a king-size bed, a day bed and floor-to-ceiling windows framing stunning views of Singapore’s skyline and the harbor. The Andaz Suite King features an additional living room and guest powder room, as well as a bathtub, a rain shower, a powder room, and double sink vanities in the bathroom. This is a premium suite. See World of Hyatt program terms for upgrade eligibility. 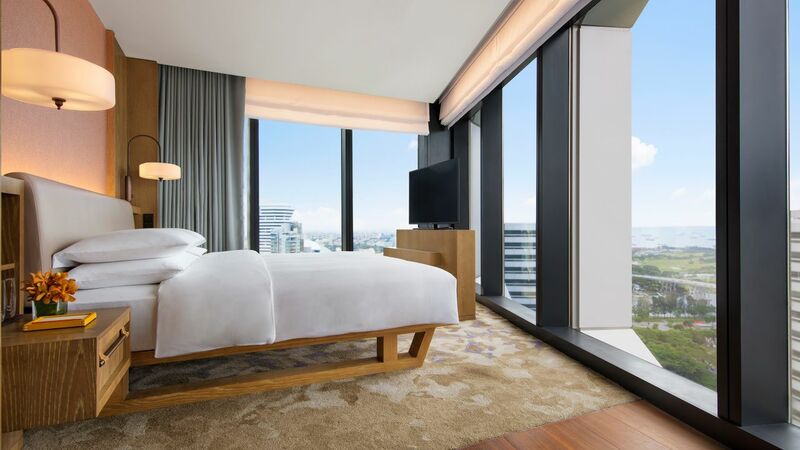 Luxuriate in this 114 sq m (1,227 sq ft) guestroom with a king-size bed, a day bed and floor-to-ceiling windows framing stunning views of Singapore’s skyline. 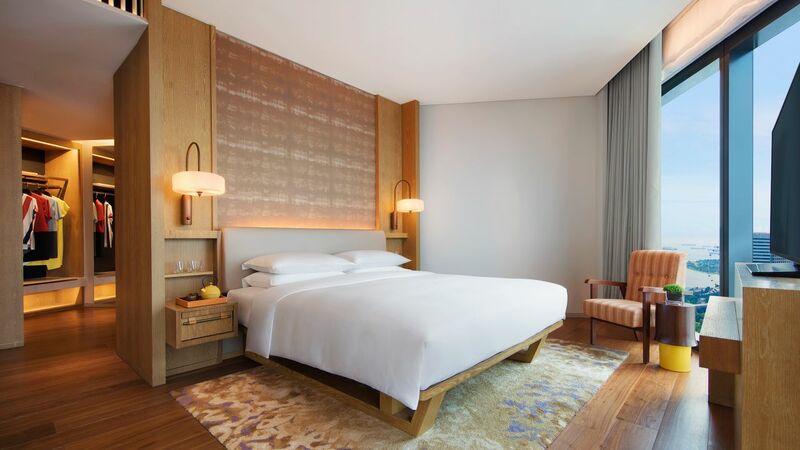 The Andaz King Executive Suite features an additional guest powder room, living room and den area, as well as a large bathroom with a freestanding bathtub and double sink vanities. This is a premium suite. See World of Hyatt program terms for upgrade eligibility. Luxuriate in this 114 sq m (1,227 sq ft) room with Hollywood Twin beds, a day bed and floor-to-ceiling windows framing views of stunning views of Singapore’s skyline. 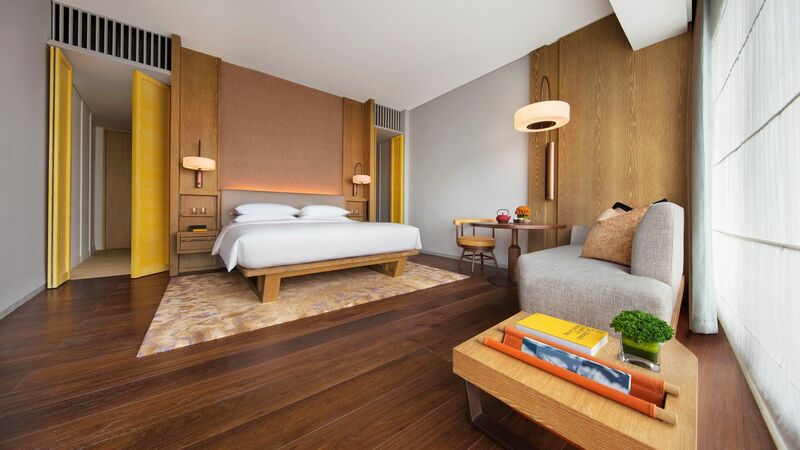 The Andaz Large Suite Twin features an additional guest powder room, living room and den area, as well as a large bathroom with a freestanding bathtub, double rain showers, and double sink vanities. This is a premium suite. See World of Hyatt program terms for upgrade eligibility. 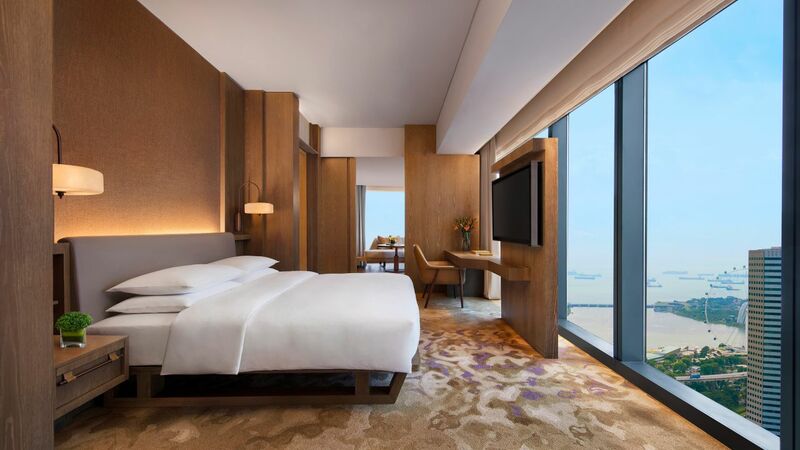 Luxuriate in this 152 sq m (1,636 sq ft) guestroom with a king-size bed, a day bed and floor-to-ceiling windows framing stunning views of Singapore’s skyline, the harbor and Marina Bay area. The Presidential Suite features an additional study, an entertainment room, a guest powder room, a living room and a den area, as well as a large bathroom with a freestanding tub, double rain showers, and double sink vanities. This is a premium suite. See World of Hyatt program terms for upgrade eligibility. Rest in this 38 sq m (409 sq ft) guestroom with a king-size bed, a daybed, en suite bathroom with shower, and floor-to-ceiling windows framing views over our vibrant neighborhood. Rest in this 38 sq m (409 sq ft) guestroom with Hollywood twin beds, a day bed, en suite bathroom with shower, and floor-to-ceiling windows framing views over our vibrant neighborhood. Relax in this 38 sq m (409 sq ft) guestroom with a king-size bed, a day bed and floor-to-ceiling windows framing stunning views of the harbor or Singapore’s skyline. 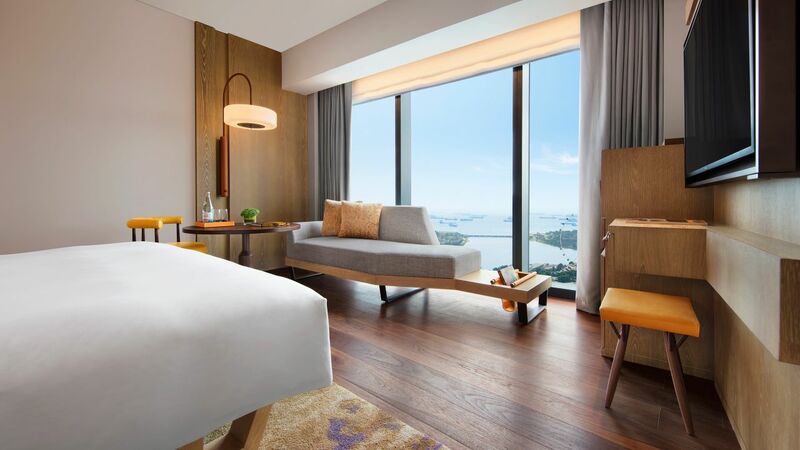 Relax in this 38 sq m (409 sq ft) guestroom with Hollywood Twin beds, a day bed and floor-to-ceiling windows framing stunning views of the harbor or Singapore’s skyline. 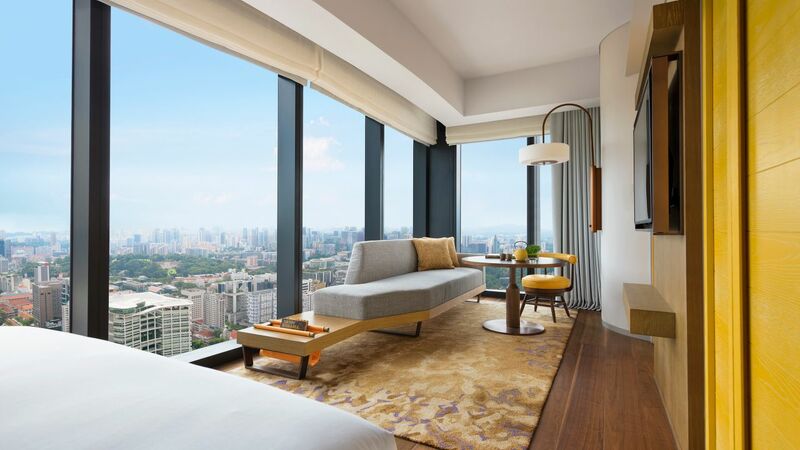 Relax in this 42 sq m (452 sq ft) contemporary guestroom with a king-size bed and floor-to-ceiling windows framing stunning views of Singapore’s skyline. 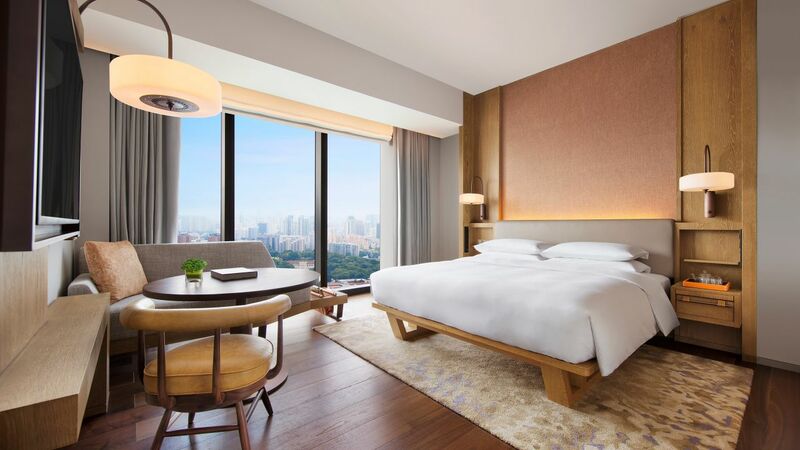 Rest in this 38 sq m (409 sq ft) guestroom with a king-size bed, a day bed, en suite bathroom with shower, and floor-to-ceiling windows framing stunning views of Singapore’s skyline.